Solas Prop Amita A3 Johnson/Evinrude/BRP Alum 9.9-15HP 10 | 2111-093-10. AMITA 3 - Outstanding acceleration and top speed SOLAS uses a state of the art squeeze casting process to make our aluminum propellers stronger and tougher than traditional die cast products. Solas Prop Amita B3 Johnson/Evinrude/BRP Alum 20-35HP 15 | 2211-100-15. AMITA 3 - Outstanding acceleration and top speed SOLAS uses a state of the art squeeze casting process to make our aluminum propellers stronger and tougher than traditional die cast products. Solas Prop Amita C3 Johnson/Evnrd/BRP Alum (Small GC) 13 | 2311-125-13. Prop Pitch: 13-Pitch. Wide blade design specifically for 4-stroke engines. Lights & Flashlights. Hosters, Recoil Pads. Scopes, Rings & Mounts. Solas Propeller Amita 3 Aluminum. - Exclusive Solas squeeze casting process. Fits on: Johnson, Evinrude, BRP. - Three blade aluminum propeller. - 3 Blade Aluminum Propeller. 35 HP 2 Cyl 1979 to 1983. Solas RBX100 Rubex Hub Kit For use with Rubex Interchangeable Hub System Propellers. 90-300 HP 1991 & Newer; 15 Spline 4-3/4" Gearcase. OMC/Cobra Sterndrive. Solas # 2411-130-19. Solas Amita 3 Aluminum Propeller Features This Boat Prop fits the following Evinrude Johnson outboard Motors with a 13 spline prop shaft -40 HP E-TEC…. 2004 & newer. -50 HP E-TEC……… 2004 & newer. Solas Prop 4-Blade Stainless Propeller E series Rubex HR4 | 9553-141-19. Four blade stainless steel propeller. High rake blade with large cupping design. Material: Stainless Steel. Helpful Links. Trolling Motors & Accessories. We are constantly improving processes and striving even higher. Performance and durability are the characteristics of the SOLAS stainless steel products. SATURN 3 - General Purpose Propeller All SOLAS propellers are developed by a state of art process. Solas Prop 4-Blade Stainless Propeller E series Rubex HR4 | 9553-143-17. Four blade stainless steel propeller. High rake blade with large cupping design. Material: Stainless Steel. Helpful Links. Trolling Motors & Accessories. Solas Prop Amita E3 Volvo Aluminum SX Drive 21 | 8611-143-21. AMITA 3 - Outstanding acceleration and top speed SOLAS uses a state of the art squeeze casting process to make our aluminum propellers stronger and tougher than traditional die cast products. RUBEX 4 blade STAINLESS STEEL Prop. SOLAS 9553-145-15. SOLAS High Performance / Rubber Hub. Exclusive Solas squeeze casting process. 135-300 HP 4 Blade RH. Four blade aluminum propeller. Propeller Pitch: 13. Propeller Rotation: Right H. - Propeller 10-1/8 x13. - Right hand rotation. 25 HP 2 & 3 Cylinder 1984 & newer (14 Tooth). 20 HP 2 Cylinder 1984-1987 (14 Tooth). 30 HP 2 Cylinder 1984 & newer (14 Tooth). SOLAS RUBEX 9553-141-19. 4 BLADE STAINLESS STEEL. 14 1/8 X X19. See below for item specifics. Part Number: 755184. Make: OEM Johnson and Evinrude. Condition Notes: Rebuilt Propeller. Material: Aluminum. Pitch: 19". Spline Count: 13. • Exclusive Solas squeeze casting process. 300 HP V8 (15 Spline) 1991 - 1995 OMC. 300 HP DF300 (15 Spline) All Years OMC. 3.6 L V8 (15 Spline) 1986 - 1987 OMC. 2.0L - 4.0L Sea Drive (15 Spline) 1991 - 1994 Evinrude. 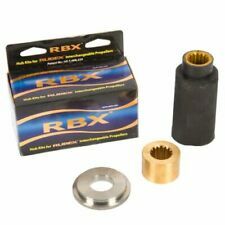 RUBEX 4 - Outstanding acceleration and top speed Every Rubex stainless steel or aluminum boat propeller has a rubber interchangeable hub system. It is designed to eliminate chatter and vibration that competitive hub systems are prone to. Propeller Pitch: 17. Propeller 13-1/4 x 17. Propeller Rotation: Right Hand. 3 Blade Aluminum Propeller. 80 HP 1978 to 1989 80 HP (Mariner) 1978 to 1983. 140 HP (Yamaha) 1978 to 1979 Models 900 to 1500 up to 1977 (FORCE). New in box, never touched water. B4 10 X 13 RIGHT Hand Solas Propeller With Hub Kit included. Comes as seen in picture. 4 Blade Aluminum Propeller. - 300 HP V8 1986 to 1995. - 90 HP E90 DPX (E-TEC) 2006 & Newer. - 90 HP V4 1995 & Newer. - Pitch: 17". (below the price of the item). - 140 HP 2-Stroke 1989 to 1994-. - 185 HP V6 1984 to 1985. PROP (Amita 4). Solas Propeller Amita 4 Aluminum. Nissan Tohatsu. - Exclusive Solas squeeze casting process. 15 HP (4-Stroke) - 2007 to Newer Tohatsu. 20 HP (4-Stroke) - 2007 to Newer Tohatsu. Nissan Tohatsu Outboards. PROP (Amita 4). Solas Propeller Amita 4 Aluminum. Nissan Tohatsu Outboards - Exclusive Solas squeeze casting process. 25 HP 4-Stroke (Not Bigfoot) Japanese Origin (Tohatsu) - 2006 & Newer. 30 HP 4-Stroke (Not Bigfoot) Japanese Origin (Tohatsu) - 2006 & Newer. Propeller Pitch: 19. Propeller Rotation: Left Hand. •3 Blade Aluminum Propeller. To Fit: 135 & Higher HP. 135 HP 1987 & UP. 135 HP 2004 & Newer. •Pitch: 19". (below the price of the item). PROP (Amita 4). Solas Propeller Amita 4 Aluminum. - Exclusive Solas squeeze casting process. Johnson Evinrude. Johnson, Evinrude & BRP Outboards 8 Pitch 4 Blade. - Pitch: 8". - Four blade aluminum propeller. Solas HR Titan 14-1/8 x 19 Stainless Steel Propeller Manufacturer: Solas Brand: HR Titan Material: Stainless Steel Diameter: 14-1/8" Pitch: 19" Blades: 4 Rotation: Standard (Clockwise) Stainless steel propeller. Provides great stern lift and acceleration. High rake blade with large cupping design for high efficiency at greater speeds and minimizing cavitation under heavy loads. Delivers powerful thrust and very smooth performance. Increased speed and fuel efficiency in engines mid-range. Tough heavy duty rubber bushing smoothest shifting and won’t slip. Solas stainless steel propellers feature the industries highest percentage of chromium, nickel and molybdenum materials to resist rust from salt water and increase the stability of the propeller blades. New in box, never touched water. E4 14.25 X 19 LEFT Hand Solas Propeller With Hub included. Comes as seen in picture. Rubex NS4 - All-Around Performance, Big load Every Rubex stainless steel or aluminum boat propeller has a rubber interchangeable hub system. It is designed to eliminate chatter and vibration that competitive hub systems are prone to. 20" Pitch 4 Blade RH 15 TOOTH SPLINE 135 HP -& UP. Solas Prop 4-Blade Aluminum Propeller E series Rubex 4 | 9513-140-21. SOLAS High Performance / Rubber Hub. Exclusive Solas squeeze casting process. Unlike competitive hubs, the prop nut does not require periodic re-torquing on a Rubex propeller system. Manufacturer: Solas Brand: Amita Material: Aluminum Diameter: 14-1/4" Pitch: 19" Blades: 4 Rotation: Standard (Clockwise) High quality aluminum propeller. Universal blade design to fit wide variety of applications. Trending at $130.16eBay determines this price through a machine learned model of the product's sale prices within the last 90 days. 13 x 21p right hand 15 spline ruber hub. Solas Amita 14 x 21 Aluminum Propeller Manufacturer: Solas Brand: Amita Material: Aluminum Diameter: 14" Pitch: 21" Blades: 4 Rotation: Standard (Clockwise) High quality aluminum propeller. Universal blade design to fit wide variety of applications. Designed for outstanding acceleration and top speed. Tough heavy duty rubber bushing smoothest shifting and won’t slip. Exclusive Solas squeeze casting process nearly eliminates porosity making our aluminum propellers stronger and tougher than traditional die cast propellers. Solas aluminum propellers have 4 layers of paint applied using superior coatings and high-tech painting process to ensure excellent anti-corrosion performance. Solas Propeller Amita 4 Aluminum. - Exclusive Solas squeeze casting process. PROP (Amita 4). 15 Pitch 4 Blade. - Pitch: 15". - Four blade aluminum propeller. - Wide blade design specifically for 4-stroke engines. Solas Prop Amita E3 Johnson/Evnrd/BRP/Cobra Alum V6/GC 17 | 2511-148-17. AMITA 3 - Outstanding acceleration and top speed SOLAS uses a state of the art squeeze casting process to make our aluminum propellers stronger and tougher than traditional die cast products. To a wide range of applications. Solas Amita 4 Aluminum Propeller Features to repair than any other prop. Pressed rubber hub. 13" Pitch 4 Blade RH. Fits 15 Tooth Spline & Thru Hub Exhaust. Wide blade design specifically for 4-stroke engines. Solas Propeller Hardware Kit Mercury. 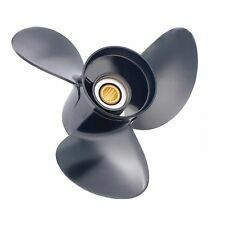 Boat part number 1070043 is a new Rubex HR4 series 4 blade 14 1/2 x 16 pitch propeller from Solas, part number 9553-145-16. 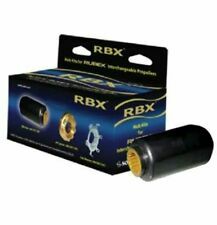 Series: Rubex HR4. Part Manufacturer: Solas. This is a new 14 1/2 x 16 pitch 4-blade stainless steel right hand rotation propeller. Solas 2413-133-13 Prop Johnson Evinrude 13.25'' 13'' Pitch 4 Blade Right OMC. Our material resists rust from salt water and increases the stability of the propeller blades. Four blade stainless steel propeller. Prop Pitch: 17-Pitch. We are constantly improving processes and striving even higher. • 3 Blade Aluminum Propeller. • 1 5 Tooth Spline propeller Shaft. 80 HP Mariner 2 Stroke 1977 to 1983. 140 HP All include Sea Pro and Offshore 1978 to 1981. 60 HP Seapro or Marathon 2 or 4 Stroke 1995 & UP. Solas Prop Amita E3 Volvo Aluminum SX Drive 19 | 8611-145-19. AMITA 3 - Outstanding acceleration and top speed SOLAS uses a state of the art squeeze casting process to make our aluminum propellers stronger and tougher than traditional die cast products. Trending at $125.96eBay determines this price through a machine learned model of the product's sale prices within the last 90 days. The SOLAS New Saturn 13-1/4 x 17 RH 2431-133-17 boat prop is known for all around excellent performance. The stainless steel SOLAS New Saturn 2431-133-17 provides excellent performance through the large EAR desig n.
Up for sale is a new Solas Amita 3 propeller part number 4411-140-11. SOLAS Amita 14 x 11 RH 4411-140-11 propeller. Rotation: RH. Engine: SUZUKI 60-140HP. AMITA 3 - Outstanding acceleration and top speed SOLAS uses a state of the art squeeze casting process to make our aluminum propellers stronger and tougher than traditional die cast products. SOLAS aluminum propellers have 4 layers of paint. We are constantly improving processes and striving even higher. Performance and durability are the characteristics of the SOLAS stainless steel products. NEW SATURN 3 - General Purpose Propeller All SOLAS propellers are developed by a state of art process.